Wolfcub baby nail files new! The ultimate nail file, designed by guitarists for guitarists. Optimised for great fingerstyle tone and control. A perfect file for every player. Your nails are a crucial part of the interface with your guitar. Long or short, the shape, finish and condition of your nails define the tone you get from your instrument. So many players chase tone while ignoring these vital assets; those who do take care of ther nails often use a bewildering array of clippers, files, sandpaper and buffers to get the results they need. Precision : Crystal is the only nail file developed by guitarists, for guitarists. We developed Precision : Crystal as the ultimate nail file - a single tool to shorten, shape and finish your nails to achieve and perfect your unique tone, quickly and consistently. Etched into the highest-quality, hardened lead-free Bohemia crystal, our unique, perfectly even filing surface is calibrated to leave a finish perfect for great fingerstyle guitar tone - no need for further buffing or polishing. Unlike other files with a sharp abrasive which tears at nails, causing chipping, tearing and cracking, our fine, etched surface turns nails safely and smoothly to dust, helping to keep them strong, healthy and in top condition. 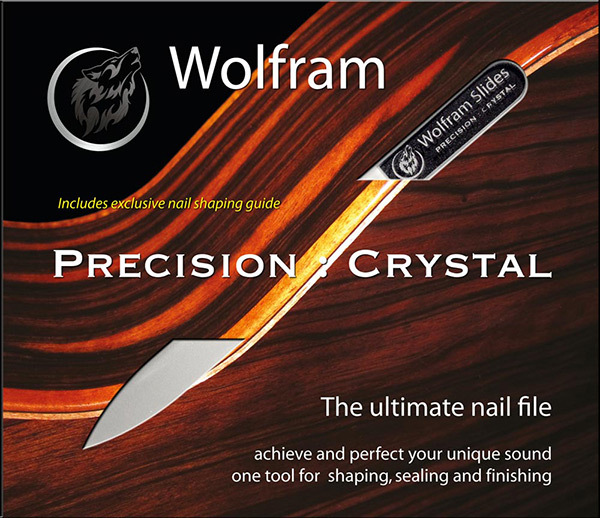 You can use a Wolfram file freely in either direction across the nail (most files will damage the edge of the nail if unless used towards the centre) leaving you to focus on shaping. 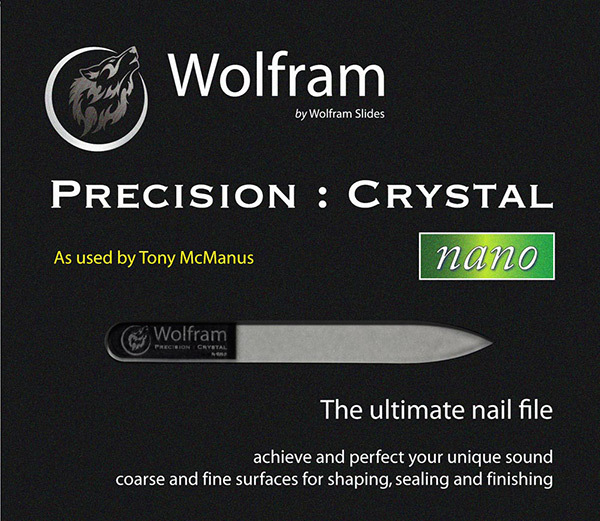 Join the many professional guitarists all over the world who trust their nails - and their tone - to Wolfram Precision : Crystal. "Superb, you've changed my life. The BEST tone from my nails ever. It's that good!" 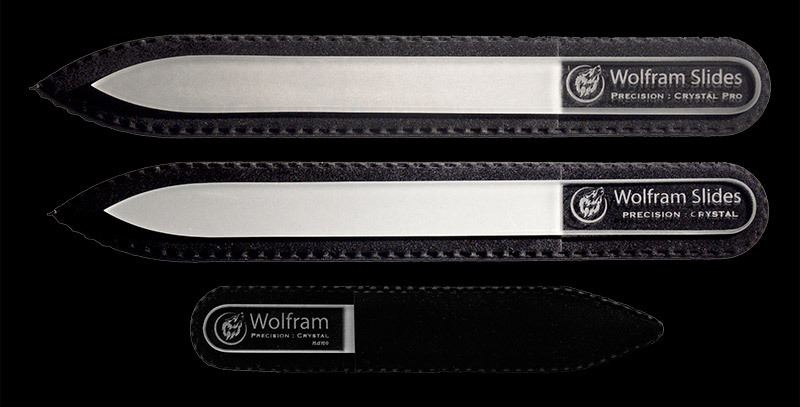 Unique, super-fine filing surface - the highest-quality nail file available anywhere. Pressure sensitive for unprecedented control and precision - works just like a whole range of conventional grits. Seals and finishes the nail, leaving a beautiful smooth nail finish calibrated for perfect fingerstyle guitar tone. Use freely in any direction with no risk of chipping or splitting - you're free to concentrate on shaping. Your calluses are safe - non-abrasive on skin so will not harm when filing 'into the corners'. Safe and gentle, helping to keep nails strong, healthy and in perfect condition. Significantly reduces problems with brittle, peeling, cracked or split nails. Double-tempered filing surface is over 200% tougher than standard glass. Filing surface guaranteed for life - it will never wear out! The only crystal nail files with two different filing surfaces! Fine surface: identical to our much-loved original file. Coarse surface: optimised for shaping hard artificial nails. 50% thicker and heavier for additional control. The same coarse and fine filing surfaces from our Pro file. All Precision : Crystal files come with our exclusive guide to nail shaping for guitarists, and a black velvet storage sleeve. Understanding your nails and how their shape affects your guitar tone can be daunting - the more so because different natural nail shape and curvature mean that everyone's nails respond differently. Our exclusive nail shaping guide explains how the nail interacts with the string, gives you pointers on what to look for and provides an overview on how nail shapes affect tone. Find out how you can achieve your perfect tone with Precision : Crystal. All of our files come with a fitted black velvet storage sleeve. Precision : Crystal has the finest and most consistent surface available. 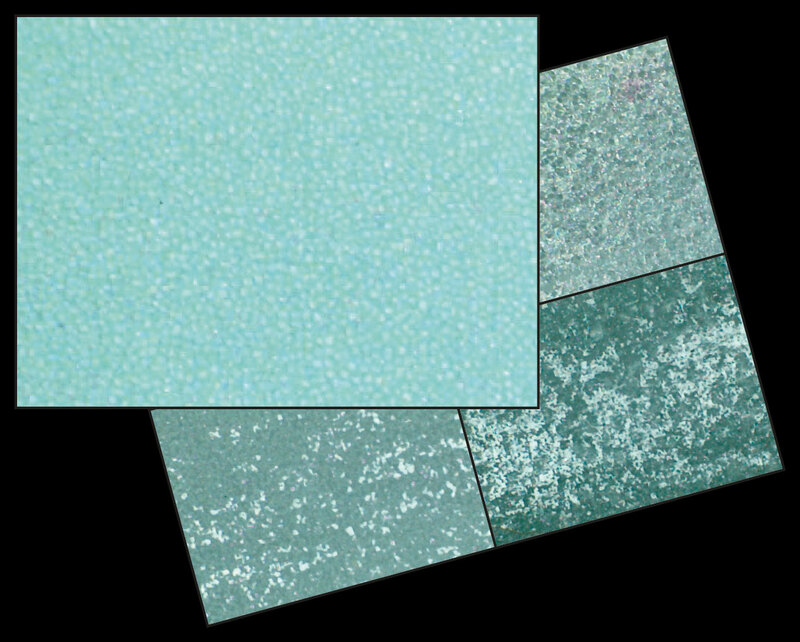 This comparison to three other popular glass files, at x400 magnification, shows the fineness and consistency of our unique fine filing surface. All glass nail files are not created alike! Precision : Crystal is not just a generic glass nail file with a logo on it. 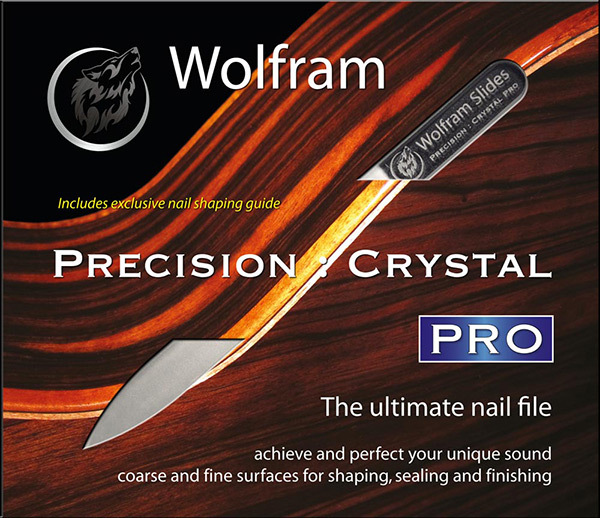 Precision : Crystal is made for Wolfram in the Czech Republic from genuine lead-free Bohemia crystal - the only glass with the special combination of hardness and flexibility needed to create the hghest-quality, most durable nail files. Our unique filing surface is acid-etched directly into the crystal, in a proprietary process that creates the finest, most consistent surface available. This perfect surface, devoid of rough or sharp irregularities, imparts the beautiful nail finish unmatched by any other file, glass or otherwise. Our Pro and nano files are the only crystal files available with two different filing surfaces - coarse and fine. Because the abrasive is not sharp, Precision : Crystal can be used in any direction across the nail without chipping or splitting - leaving you free to concentrate on shaping for tone. The edges of the file are shaped and polished by hand for a luxurious feel. The file is then heat-treated twice to temper it, raising the surface hardness by over 300%. This hardened filing surface will never wear down, while the file retains a supple core for maximum resilience. 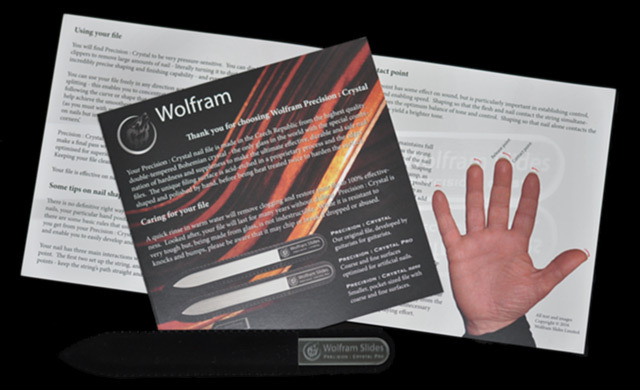 Looked after, a Wolfram nail file will last for many, many years. "The tone-boosting tool you never knew you needed." "Ultra-lightweight, comfortable and easy to use with excellent results. In truth, nail sculpting is an art form … that becomes easier to master with such high-quality files."